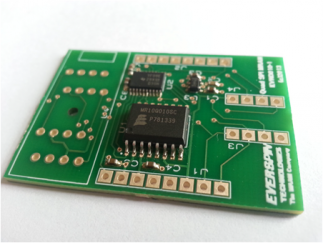 The Everspin MR10Q010 Quad SPI Serial MRAM requires a 3.3v Vdd power supply and is designed to operate on a 1.8v bus I/O. Adapting the MR10Q010 to operate on a 3.3v data bus can be done by interfacing the MR10Q010 to the bus through a level translator. A linear regulator can be used to supply the 1.8v power required by the MR10Q010. The MR10Q010 Evaluation board uses a TXB0108 bidirectional level translator and a TPS73018 low-dropout regulator, both from Texas Instruments. The board is designed so that it can be connected at the board position or socket that is currently occupied by a SPI or Quad SPI EEPROM and operate within the existing system. Test points are located on the board for all MRAM and EEPROM pins. For evaluation of MR10Q010 operating in a 3.3v I/O data bus system. 8-pin DIP site to allow mounting as a daughter board to operate in place of an existing 8-pin SPI or Quad SPI EEPROM. MR10Q010 receives 1.8v power from an on-board regulator. All MR10Q010 and E2PROM pins assessable by 0.1 inch pitch through-hole connection points. May be supplied with ZIF socket for MR10Q010 or with the MRAM loaded on the board.